By Dan Ambrose: If you were one of the many boxing fans who were counting on Mexican star Saul “Canelo” Alvarez (45-1-1, 32 KOs) in fighting IBO/WBA middleweight champion Gennady “GGG” Golovkin (33-0, 30 KOs) after they get through their next fights against WBC middleweight champion Miguel Cotto (40-4, 33 KOs) and IBF 160lb champion David Lemieux (34-2, 31 KOs), you might be disappointed to learn that Canelo’s promoter Oscar De La Hoya is saying that Canelo might not take the fight with Golovkin after the Cotto fight. 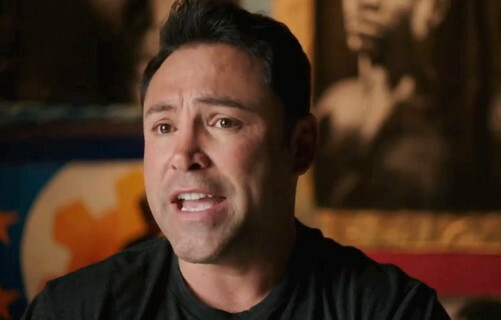 De La Hoya says that Canelo will eventually get around to fighting the Kazahstan star at some point. Just when that will happen is unknown at this point. Cotto and Canelo have a verbal agreement to face each other in a rematch, and neither of them has much of an incentive step forward and face a dangers puncher like Golovkin until they’ve exhausted the money they can make in facing each other. This means that the winner of the Cotto-Canelo fight will either be stripped of their WBC middleweight title for failing to fight Golovkin in their next fight, as determined by World Boxing Council president Mauricio Sulaiman. De La Hoya’s comments here tell you loud and clear that Canelo will not be fighting Golovkin in his next fight after the Cotto fight. We might not even see Canelo fight Golovkin after a second fight with Cotto. I’d be willing to bet that if the second Cotto-Canelo fight rakes in a lot of money like the first one will undoubtedly do, De La Hoya will look to make a third fight between them rather than throw Canelo to the wolves by putting him in with Golovkin. You have to remember that Golovkin will always be there waiting for Canelo no matter what. There’s no one out there that is going to beat Golovkin, so he can be counted on to be waiting for Canelo to eventually show interest in the fight. If it was another fighter with less talent or at an advanced age, then De La Hoya would need to put Canelo in with that fighter soon so that they could face him before he gets beaten. But that’s not the case with Golovkin because he’s the king of the middleweight division, and he will remain the king even if Canelo destroys the soon to be 35-year-old Cotto on November 21st in their fight on HBO pay-per-view from the Mandalay Bay Resort & Casino in Las Vegas, Nevada. Even if Floyd Mayweather Jr. were to step up to agree to fight Golovkin, De La Hoya and Canelo would rest assured that Golovkin would get through that fight without any problems by him knocking Mayweather out with a single shot to the head. Of course, Mayweather isn’t going to ever agree to fight Golovkin, because he’s very guarded about his resume and he wants to finish his career with an unbeaten record. If Mayweather were to fight Golovkin, then he’d have to finish his career with at least one defeat. There’s no question that Cotto and Canelo will be fighting each other in an immediate rematch, and Golovkin is going to have to sit around and wait to see if the winner of their series of fights will eventually fight him. If Golovkin and his promoter Tom Loeffler are smart, they would forget all about Cotto and Canelo’s names and pretend that they don’t even exist. Golovkin and Loeffler should blaze their own trail and fight whoever they can because if they sit around waiting for the winner of the Cotto-Canelo fight to face them, they’ll likely be waiting for nothing and they’ll have little to show for waiting all that time. The last thing that Golovkin needs is to become another Amir Khan, who has been waiting for three years to get a big fight against Floyd Mayweather Jr., and he’s got nothing to show for those lost years. Golovkin wants Cotto or Canelo, but he’s clearly not going to get either of them anytime soon in my view. That’s why Golovkin should move on after he beats Lemieux on October 17th and he should focus on facing the best opponents he can. I don’t see Canelo fighting Golovkin for at least two more years, possibly more. De La Hoya is going to wait until Golovkin has aged before he makes that fight with him, and he’s going to make sure that Canelo has exhausted all the big fights he can before he finally gives him the green light to fight the Kazakhstan star. As for Cotto, I don’t see him ever agreeing to fight Golovkin. I don’t think it will happen. If it were to happen, I think Golovkin would likely have to agree to really small money before Cotto would agree to take the fight, and it wouldn’t even be worth it for Golovkin to make it. There’s no way Golovkin would get a 50-50 cut of the financial pie with Cotto. Golovkin likely couldn’t even get the deal that Canelo is getting because he doesn’t have a huge built in fan base like Canelo has in the United States. At best, I could see Cotto offering Golovkin no more than a 70-30 deal, which would be a lousy deal for Golovkin considering that he’s perceived to be the best fighter in the middleweight division. Golovkin is going to keep getting popular more and more even if Canelo and Cotto never fight him. But the last thing that Golovkin needs to do is to agree to a deal that is beneath him just to get a fight that he wants. He doesn’t need to be taken advantage of. However, I think that’s the only way he’s going to be able to get a fight against Cotto is if he agrees to take the really small money. It’s probably not a fight that Cotto is excited about making due to the risk involved, so if Golovkin doesn’t accept an offer to fight him, Cotto can at least say he offered him a deal and he didn’t want to accept it.